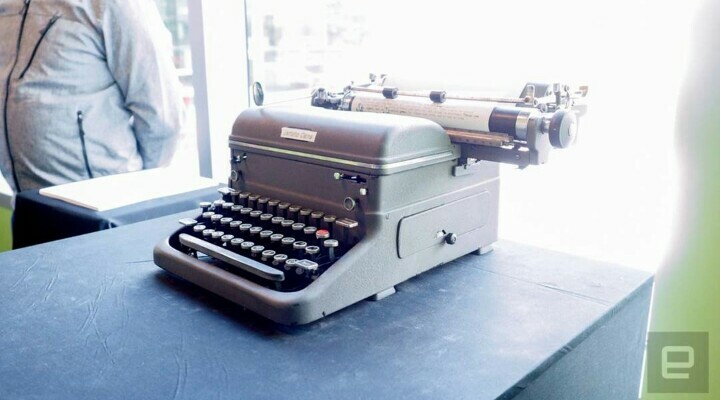 A metal typewriter sits on a pedestal churning out the next sentence of a collaborative story. For every line I typed onto paper, the AI computer controlling the hunk of metal replies with what it thinks would be a good follow up. The goal of the experiment is to see what happens when you feed an artificial intelligence only fairy tales. It’s the kind of seemingly idiosyncratic thing you’d expect from IBM, Google or Apple. But I actually found it inside Mercedes Benz’s R&D North American headquarters in Silicon Valley. The German automaker is trying to see what happens when you let a computer learn how to write, space and spell on its own. The experiment could help researchers build an artificial brain for a car that could independently deduce and react to what’s happening on the road. It might seem like these things are unrelated, but a typewriter cranking out sentences and a car automatically braking to miss an object in the road are both utilizing the learn and react system of AI to get a job done. All that deep learning is one building blocks of autonomous systems. Another import aspect of self-driving cars is that the computers needed to keep them on the road not only have to learn and react but also actually see what’s going on. Most automakers use Lidar to scan the surrounding world with lasers to create a vast pixel map. The amount of data created by all those pinpoints is staggering. Mercedes thinks it’s solved the problem of trying to crunch all that information by joining blocks of pixels to create single objects. So instead of an automobile trying to decipher 500,000 pixels, the car only has to figure out the location of 1,000 object-specific rectangles called “Stixels.” Each Stixel can be a person, car, or object and is assigned a color based on how close they are to the vehicle. Experiments like this are part of the company’s new CASE (Connected, Autonomous Driving, Shared usage and Electric drive) strategy. Mercedes wants to build its own future instead of teaming up with a tech company. When you’re beholden to another entity, you’re stuck with whatever they decide to add to their platform. So it’s got its Silicon Valley facility working hard on a variety of initiatives. During a recent tour of the R&D headquarters, I saw the shiniest result of those initiatives and latest CASE project, the EQ concept vehicle it unveiled at the Paris Auto show. The electric car has autonomous features, replaced the dash with a giant display and shed all of its mirrors in favor of tiny cameras. While the vehicle looks like it’s a prop from a reboot of TRON, it’s actually the launching pad of the EQ line of vehicles and home energy storage. Sadly the concept vehicle on display will never appear in showrooms. 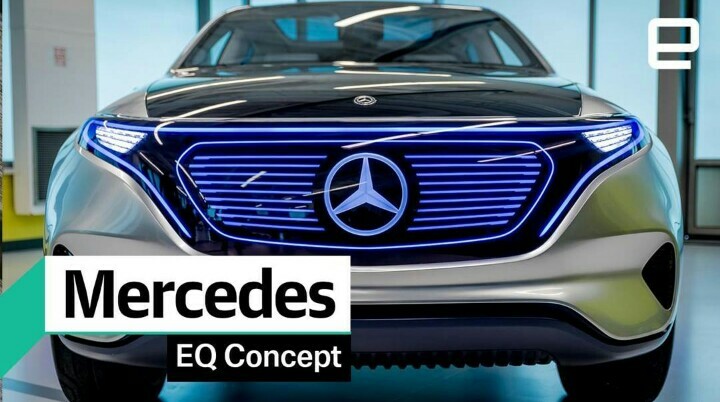 Instead it’s a marketing tool for the launch of the upcoming EQ brand of vehicles and mobility initiatives that will start appearing in three years. It’s a new category within the company similar to Smart, it’s small-car subsidiary. But while the new business venture is a ways off, the automaker is already adding connected features to its current and upcoming lineup of Mercedes Benz vehicles. The automaker already has an iOS and Apple Watch companion app for locking the doors. In the next year it’ll be adding Google home support. Drivers will be able to interact with the search-giant’s home assistant with the sound of their voice while driving. The integration will also learn a person’s habits and will offer to turn on or off devices based on the car’s location via AI. Don’t worry if you’re already part of the Alexa or HomeKit ecosystem, both of those platforms are being investigated. But it’s not just the cars Mercedes sells to individuals that are being upgraded. The automaker is working on speeding up deliveries from services like UPS, FedEX and DHL. In a garage a few miles from the main building, a team of researchers are building a carpet-like covering for the shelves and floor of a delivery van that can weigh a package no matter where it is. I was initially unsure why the weight of each box was important. That was until they explained that the system can pinpoint the location of any item in the truck based on its mass and can have nearby LEDs light up when the driver needs to find said package. According to Mercedes, tests of the system with local delivery drivers have increased efficiency 35 percent. The drivers no longer have to hunt for a box that slid around the back of the truck during a sharp turn, the system just knows where everything is. It’s research like this that could help the automaker maintain the pace needed to compete in the increasingly accelerating automotive tech landscape. It’s a legacy brand that’s seen the cars changing quicker in the past few years than in the previous 90. It’s done a good job keeping up, but pressure from Tesla, Google and established automakers means it has to be more nimble and think outside horsepower and tires. Even if it means experiments with mechanical typewriters and fairy tales. Previous Previous post: Five ways to get your iPhone, iPad, and Mac backups going for 2017!